In this space, we are reviewing today, the Canon PIXMA MG 2570. 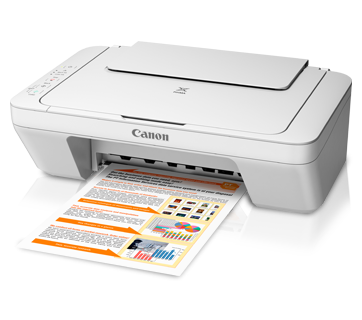 This is a multi-function ink –jet printer that offers the print, copy, scan and Auto on/ off features. Ink Jet printers, although slow at printing, are cheaper on the pocket as compared to laser printers and are perfect for personal use. The document tray to load documents for scan or Xerox, comes with a platen glass. After placing the document in the tray and closing the tray’s lid, one needs to just press one of the start (colour / black) buttons to facilitate the process of copying or scanning. The paper output tray can be extended in three parts and it is recommended by the manufacturers to ensure full extension when printing is on. The cover panel can be easily removed in the case of paper jamming or to replace ink cartridges. The ink cartridges provided with the machine at the time of first installation are 1 black and 1 colour. Compatible fine cartridges for this model are: Colour – CL-746, PG-745. On the operation panel are the start button (used to switch the machine on or off); the start lamp (indicates if the machine is on or not); the alarm lamp (flashes when printer is out of paper or ink is low); ink lamps (lights up when printer is out of the ink – black or color); stop button (to abort an ongoing print / Xerox / scan operation); and color buttons (to facilitate Xeroxing in color or black). This MG 2570 also has a feature of Auto ON/ OFF. The printer automatically turns on if the print command is given and turns off if there is no print command for a long time. The Canon PIXMA MG 2570 has a smooth curvy design and comes in a combination of white and creamy grey combination. There are no sharp edges and there is an overall clean look to it. Ease of usage: The Canon PIXMA MG2570 comes with one set of Fine cartridges which can easily last up to a month depending on the usage. It is very easy to install the drivers, load the ink, replace the cartridge when the ink is over, load the paper, align paper for the first use, and , get the printer working. - Since, it is an inkjet printer, the ink usage is not very low and the cartridge can roughly print / Xerox around 80 to 100 pages only, which is rather low compared to many other similar printers in the market. Also, because of these reasons, the Canon PIXMA MG2570 is best suited for settings where large volume printing is not needed. To Recieve updates and possible rewards for Canon MG2570 please sign in. To Recieve updates and possible rewards for Printer and Scanner please sign in.